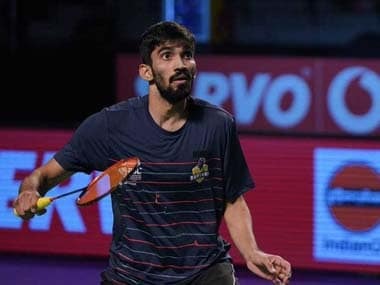 Jakarta: India ace shuttler Kidambi Srikanth today said the Indonesia Superseries Premier triumph is a much-needed boost for him ahead of the World Championship. Srikanth cliched his third Super Series title (two Superseries Premier and one Superseries) after laying claim to the Indonesia Superseries Premier men's singles crown with a straight-game victory over Japanese Kazumasa Sakai in the final here on Sunday. "I think it was a fantastic game for me. I started off really well in the first game but he was playing well in the second game, leading 11-6 at the break and fighting it out. But overall, I think my game was going great, my attack was going well for me," Srikanth said. "It is a much needed win for me. After losing the finals at Singapore Open, to reach another final here was a good thing for me. It has been a while since I won a super series tournament," he added. World No 22 Srikanth, who had reached the finals at Singapore Open in April, outclassed Sakai, ranked 47th, 21-11 21-19 in just 37 minutes to take home a cheque of $ 75,000. The 24-year-old hopes more success would come his way as he gears up for Australia Open next week ahead of the World Championship in August. "I am playing Australian Open next week. It is the last tournament before the World Championship. I am looking forward to that. It is a big confidence booster for me ahead of the World Championship. I would give my 100 per cent. I hope there is a lot more to come," he said. Srikanth, who had a long injury lay-off after the Rio Olympics, said it was tough to come out from the injury. "I was out of badminton for sometime after the Olympics, it was the longest time that I have been out ever since I started playing, so that phase kept motivating me. It was tough to come out of that injury phase and so I am really happy with this win," he added. Srikanth, who became the first Indian shuttler to win all three titles — Grand Prix gold, Superseries and Superseries Premier — went down the memory lanes and spoke about his Olympic moments which made him a better player. "It was my first Olympics and playing Lin Dan was one of the biggest matches of my career and I was under pressure. I don't know if I am in a better position now but I know no match can push me to that limit. That match gave me a lot of positives," he revealed. Talking about his final opponent, Srikanth said: "Sakai played really well. He has been playing from the qualifying and he understands the conditions really well. His smash is fast and powerful and he is very fit. It was a tricky game for sure and I am happy I could win," said Srikanth. Sakai said though he failed to cross the finishing line, he was satisfied with his performance this week. "I was very tired in the first game and my serve was not as good as I hoped. In the second game, I had hoped to maintain my lead but he got back to 13-13 and then got lead when I was 19-18. I wanted to win but I am satisfied overall with my performance here. I am happy to play at a high level here and I appreciated all the support I received," he said. Badminton Association of India (BAI) president Dr. Himanta Biswa Sarma announced Rs. 5 lakh cash award for Srikanth for winning the Indonesia Open. 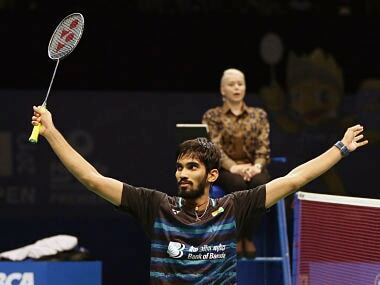 "It is a matter of huge joy for the entire country to see Srikanth triumph in Indonesia. I called him right after the match to congratulate him on this stellar win. He has made the whole country proud once again and I am quite confident he will keep doing so in future as well," Sarma said.